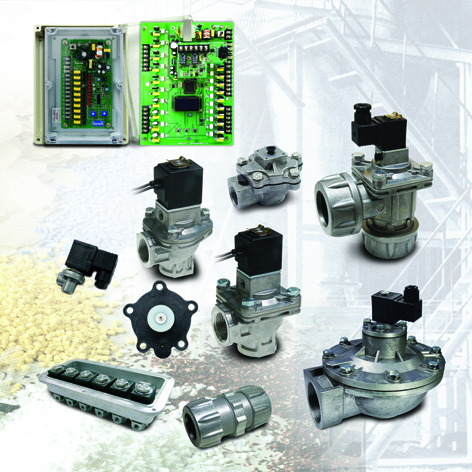 Aplus Finetek Sensor, Inc. is pleased to announce the availability of its broad line of BRD/BDV dust collector valves and the AE series of sequential controllers for use in dust collectors and baghouses. The BRD/BDV dust collector valves and AE series of controller products economically assist in improving the maintenance, safety and efficient operation of dust collectors. The BRD/BDV dust collector valves are available in sizes ranging from ¾” up to 3”. Integrated pilot valves and many other accessory items are available for these dust collector valves. The AE series is available as a programmable sequential controller or pressure differential controller. Accessory products include level sensors and indicators, aerators and pneumatic industrial vibrators (piston and rotary types) to compliment the BRD/BDV dust collector valves. For more information look at our BRD/BDV product page and contact Aplus Finetek Sensor, Inc. at 815-632-3132 or email us at info@aplusfine.com.